So if you've been to events here at An Unlikely Story, you know that you just might leave with sore cheeks from laughing so hard. Here is another one of those events! 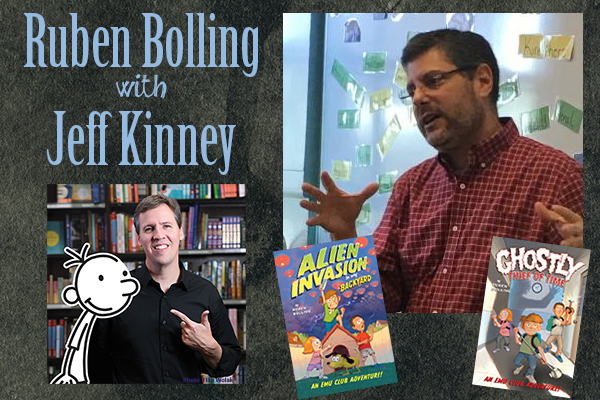 Jeff Kinney will be hosting an event with Ruben Bolling, the author of the award-winning weekly comic strip Tom the Dancing Bug, which features characters like a pre-historic ape-man, an idiot time-traveler, and a talking duck. And sometimes weird characters, like politicians. "The funniest book about unbelievable kid mystery exploring I've ever read. The only real mystery is why you aren't reading this book RIGHT NOW!" My name is Stuart Tennemeier, and I’m the President of the EMU Club (short for Exploration-Mystery-Unbelievable Club). This is my report for our first mission. Did you ever want to start a club with a friend, but you didn’t even know how to find a mystery to solve? Like, how would you even know there was a jewel heist or a haunted shack somewhere in your town? And how could you even begin to investigate it if you did? What if you started a club to solve other kinds of mysteries. Not huge crimes or weird stuff, but everyday mysteries that happen to everyone, like whatever happened to that game controller we lost? There are tons of little mysteries all around us. Sometimes if you look really, really closely at them, you find out some amazing, incredible things. And you just might save the world.